Jonas Netter, Paris, by circa 1925 until 1946. Private collection, by 1946; sale, Christie's, London, 25 June 1984, lot 19. Jacob Baal-Teshuva, New York, by whom acquired at the above sale. Anonymous sale, Sotheby's, New York, 12 November 1988, lot 353. P. Courthion, Soutine, Peintre du déchirant, Lausanne, 1972, p. 178, no. E (illustrated). M. Tuchman, E. Dunow & K. Perls, Chaïm Soutine, Catalogue raisonné, vol. II, Cologne, 1993, no. 17 (illustrated p. 546). Possibly Paris, Les Expositions de 'Beaux Arts' et de 'La Gazette des Beaux-Arts', Peintres instinctifs, Naissance de l'expressionnisme, December 1935 - January 1936, no. 141. Paris, Petit Palais, Les Maîtres de l'art indépendent, 1895-1937, June - October 1937, no. 57. 'Sometime in 1918 Soutine left Paris, probably for the first time since he had arrived in France, to visit Cagnes. The following year he visited Céret in the Pyrenees, where he later settled in 1919 for about three years. Away from the museums and galleries of Paris - and it must always be rembered how deeply responsive Soutine was to his visual environment - Soutine took great strides forward... During the Céret period Soutine, in his utter reliance on spontaneous execution, with its leaning towards the abstract, most fully embodied the expressionist vision' (M. Tuchmann et al, op. cit., vol. I, pp. 19-20). When Soutine began to focus on painting the human figure towards the end of the Great War, he chose his subjects carefully. Instead of depicting members of the fashionable bourgeois class who revelled in the new wild life of Paris as so many of his predecessors had done, Soutine chose to celebrate the working classes. Grooms, valets, cooks and servants quickly become the protagonists of Soutine's painterly world, all dressed in tightly buttoned uniforms, staring blankly at the viewer. Soutine was seeking something raw, and he found that this rawness was concealed in the sophisticated people who usually featured in portraits at the time. Indeed, it is pertinent to note that Soutine preferred to paint strangers, executing only a handful of portraits of people of his own acquaintance, Moïse Kisling, Oscar Mietschaninoff and Madeleine Castaing included. More unique documents of the era than portraits in the traditional sense, the faces that peer at us with their ambiguous emotions appear to have been trapped in the artist's gaze. Here, Madame X looks distinctly self-conscious at the intense scrutiny under which she is being examined. In part, it was this freshness to modelling that attracted Soutine to his preferred subjects. These were humble people, normal people, but crucially they were people not used to being observed in such a way. 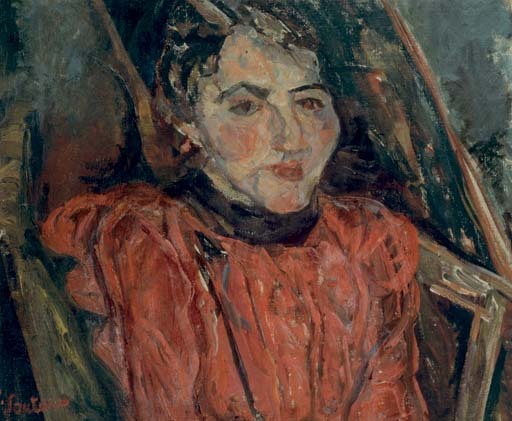 Depicting the everyday people of the street was for Soutine, who had himself known the bitter taste of extreme poverty for far too long, a celebration of the underdog, granting his sitters a relative immortality, crystallising them in oils and allowing them a claim to posterity that otherwise would almost certainly have eluded them. Painted in the immediate foreground, invading our space, these men and women become modern icons of the struggling working class. Perhaps the most striking element in Soutine's figure pictures is the unrestrained painterliness and physical distortion of the figures. Soutine's expressionistic and agitated application of paint, his sonorous palette and willful distortion of form challenge the aesthetic values in the French grande tradition - its classical sense of order in nature and its emphasis on measure and clarity. 'While his portraits do convey inner realities and make spiritual statements, they are primarily rooted in concrete perception. Though Soutine may project his inner turbulence and most personal feelings onto his subjects, the viewer never loses sight of a particular physical entity being carefully observed and experienced. Even the distortions and exaggerations of facial features and the shiftings and dislocations of body parts do not destroy the essential recognition in each painting of a certain person and a reality specific to him or her' (ibid., vol. II, p. 509).